JILA researchers are using a laser frequency comb -- a technique for making extraordinarily precise measurements of frequency -- to identify specific molecules in gases. The project is helping biomedical researchers evaluate a novel instrument that kills harmful bacteria without the use of liquid chemicals or high temperatures. Like many new measurement tools, the laser frequency comb seemed at first a curiosity but has found more practical uses than originally imagined. The technique for making extraordinarily precise measurements of frequency has now moved beyond physics and optics to advance biomedicine by helping researchers evaluate a novel instrument that kills harmful bacteria without the use of liquid chemicals or high temperatures. 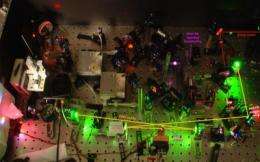 Generated by ultrafast lasers, frequency combs precisely measure individual frequencies (colors) of light. Researchers at JILA, operated jointly by the National Institute of Standards and Technology and the University of Colorado Boulder, are using such a comb to identify specific molecules in gases based on which colors of light, or comb "teeth," are absorbed by the gas, and in what amounts. Mark Golkowski, assistant professor of electrical engineering and bioengineering at the University of Colorado Denver, said JILA's comb measurements help explain for the first time how his sterilization technique inactivates bacteria, and thus will "help optimize solutions for the medical clinic where multi-drug resistant bacteria are a growing problem." "JILA provided us the unique capability of an extremely sensitive measurement and one that also yields information about the interaction dynamics, since many molecules can be simultaneously observed on short time scales," Golkowski said. In a study described in a forthcoming paper, Golkowski and colleagues conducted a variety of tests with an instrument that delivers an air stream of free radicals-highly reactive molecules-to quickly kill bacteria up to three meters away. The system achieved high-level disinfection of Staphylococcus aureus (a cause of pneumonia and other diseases) and Pseudomonas aeruginosa (often found on medical equipment) on surfaces such as plastic ID badges-a major source of pathogen transmission. The method also proved effective against difficult-to-eradicate spores of Bacillus atrophaes (found in soil) and biofilms of Escherichia coli (a cause of food poisoning). JILA/NIST Fellow Jun Ye and two members of his research group used one of their frequency comb systems to measure the concentrations of reactive molecules in the airstream-ozone, hydrogen peroxide, nitrous oxide, and nitrogen dioxide. The comb system's capability to measure hydrogen peroxide is important, because the presence and concentration of this chemical is key to effective sterilization. But crucially, the comb technique also captures the complex chemical reactions in the sterilization system in real time. "The multiple and simultaneous reactions make numerical modeling of the chemical dynamics difficult, hence the need for direct measurement of simultaneous concentrations, a capability that the frequency comb spectroscopy uniquely provides," the paper states. The remote sterilization system kills bacteria as quickly as competing treatments using bulky and expensive equipment, while also offering the advantages of low-cost hardware and flexibility of application, according to the paper. The JILA measurements are funded by NIST and the Air Force Office of Scientific Research.